To mark the 2oth anniversary of the deadly riots that engulfed Los Angeles following the 1992 Rodney King verdict, civil rights activist Al Sharpton and Trayvon Martin's parents are urging peace at events. 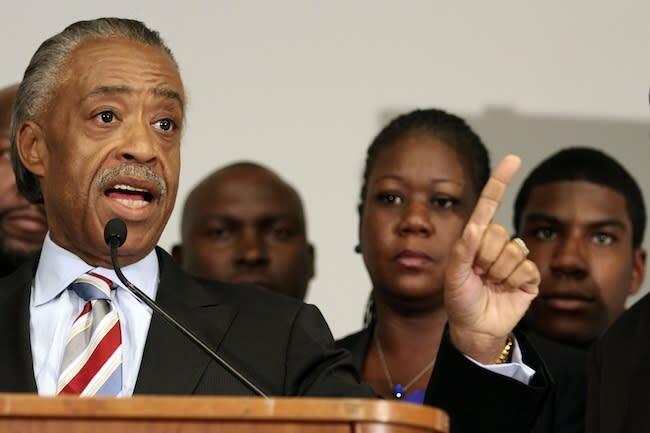 Sharpton spoke to Yahoo News before he and Martin's family addressed a church on Thursday night. "Twenty years ago I came out here after that protest after the verdict and tried to discourage the violence, and 20 years later now I'm here with Trayvon's parents and we're saying we don't want violence," he said. After four white police officers were acquitted in the recorded beating of Rodney King on April 29, the city exploded into one of the deadliest riots in American history, leaving 54 dead and causing $1 billion in property damage. Sharpton, who now hosts a show on MSNBC, says much has changed since then, and he doesn't expect the racially charged debate over Martin's shooting to end in violence if George Zimmerman, who is Hispanic, is acquitted. "I think even though people are angry and as concerned as I am, we don't feel like we have no options," he says. "Unlike [with] Rodney King, there's defined leadership in Trayvon Martin's case who have said from the beginning we cannot have violence." Zimmerman, a neighborhood watch captain in a middle-class gated community in Sanford, Florida, shot the unarmed 17-year-old after calling the cops and following him because he found him suspicious. Zimmerman says he shot him in self-defense after Martin attacked him; Zimmerman's defenders say he suspected Martin because of a string of robberies that had occurred in the neighborhood. (A recent Reuters profile of Zimmerman quotes a black neighbor defending him for finding Martin suspicious because suspects in previous robberies were young black men. She declined to be named because she feared retaliation.) Zimmerman's detractors say he singled out Martin because of his race. Sharpton says he has no idea whether Zimmerman was prejudiced against Martin because of his race, but he thinks the police would have handled the situation differently if Martin had been white. Zimmerman was briefly taken into custody but not charged with any crime; police said they found his self-defense claim credible. After the outcry, a special prosecutor charged Zimmerman with second-degree murder, more than a month after the shooting. "If Trayvon Martin had not been black then they would have had taken his killing a lot more seriously at the police station," he says. "If the police had arrested Zimmerman that night there would not be a Trayvon Martin case or movement...Does it mean he's guilty? No. But it does mean that he should have to go in front of a court of law and not be acquitted in the back of a police station."